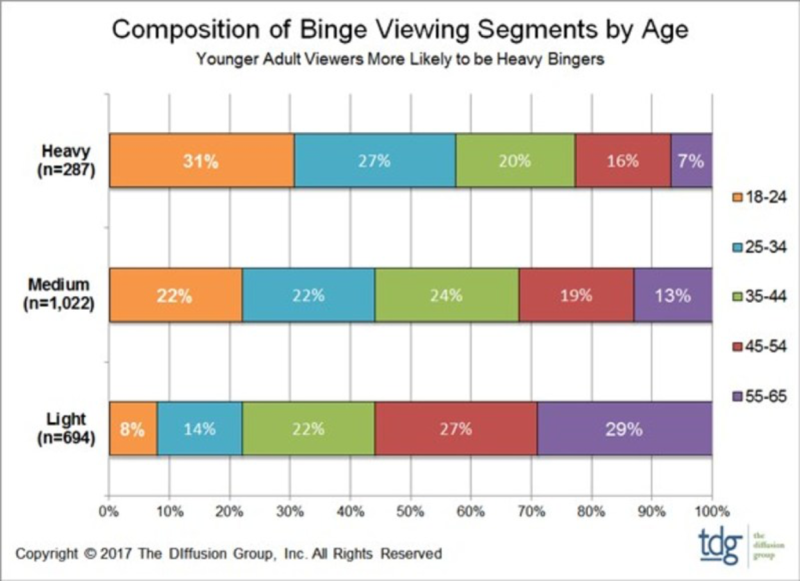 TDG’s new analysis, Binge Viewing – A Consumer Snapshot, identifies and profiles three groups of adult broadband users in terms of their binge viewing habits. Importantly, TDG analysts found that the frequency of binging is strongly correlated with the viewer’s age. For example, 58 percent of Heavy Bingers are between the ages of 18 and 34, while 56 percent of Light/Non-Bingers are age 45 and older. View TDG’s latest analysis of contemporary viewing behavior, Binge Viewing – A Consumer Snapshot for an insight into the different segments of binge viewers — who they are, how they behave, and what drives their decisions and preferences.